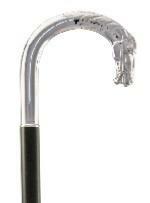 An elegant silver-plated cane in the shape of a horse's head and neck, forming a crook shaped handle. Suitable for use on the most formal occasions. Mounted on a black beech wood shaft with discreet rubber ferrule. Overall height 92cm (36").